no run today. not hungry for anything solid. buffy runs towards me as i open my bedroom door, but then quickly turns tail as her food bowl sounds with the pitter patter of breakfast biscuits. how disappointing to be shunned in the a.m., however, once she’s finished we wrestle with a rope she’s picked out of the back yard, but i chastise her for not pulling hard enough – she’s a big dog, 90lbs apparently, but i get more resistance from milly back home (and she’s not much more than 15lbs i’m guessing). dressed, car, drive (sister drives). dropped off on mlk once more and this time i walk via the alley way that cuts off mlk down the side of the longhorns for christ church. heading up the stairs at the ransom, having just walked past many busts, with one particular bust of james joyce that stands out for its acute ugliness, it is time to repeat the morning ritual: collect a locker key, stow my bag away, fold my coat and deposit that too, returning to the reception desk with just my ipad, iphone, and yellow note-taking paper, ready to accept the slip that confirms that i am authorised to be in the reading room. now, all manner of regulations have been adhered to, and i’m not even in the room yet. 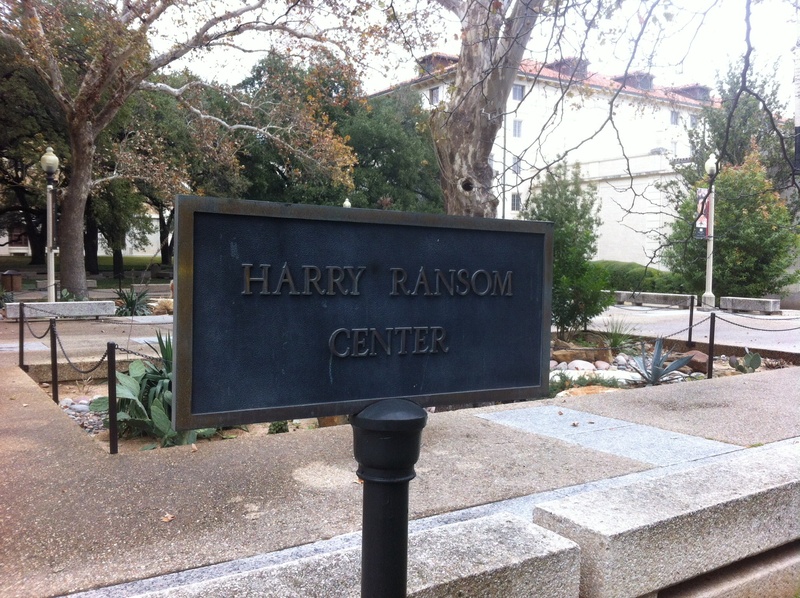 it is to be admired the way this particular section of the harry ransom center runs itself, or let me put it another way – it is to be admired the way the people who work at the center run it so very well and with what looks like, but is certainly not, the minimum amount of effort. blue slip in hand, i approach the desk where these slips are to be handed in and am greeted by my first name. a nice touch. the boxes that were pulled yesterday are still available and i carry one over to the table where you can place a box before extracting one container (file) at a time to work with at a desk of your choice. now this place is kitted out like a 1920s bank – heavy wooden tables, chairs with solid arms, table lights at eye-level, high ceiling, and thick-pile carpet beneath your feet. and then, in the relative quiet of the room, you are alone with your thoughts and the materials you have selected to look at. and how the time flies. some containers do not interest me much in terms of my research interests, but then again some provide unexpected pleasures. the methodology adopted for the research visit is to follow a list written out prior to leaving home. there are certain moments across the corpus that stand out as being worthy of close attention, but what exactly did i imagine i would find amongst the archive? at this stage it is frightening to think that there may not be any kind of revelation, and would i know it if i happened upon it? what becomes evident very soon is the amount of work that has gone into wallace’s writing. not that i imagined a writer’s life to be any sort of picnic, but the amount of manuscripts that go back and forth between the author and copy editor, and the negotiations that take place between a writer who has a complete vision of how a work should be seen by the public and the editorial team who cannot possess that same vision and who have magazines/books to sell, has to be seen to be believed. before i know it, it’s time for fresh air and lunch. i did indeed head back for a chai latte – with the coffee bar’s free wifi proving an added bonus for checking emails and stuff. then it’s back to ploughing through container after container (got through 20 containers on day one). some containers hold as little as a sheet of paper. others carry countless manuscripts and documents. i must admit that i only felt like i was getting somewhere at the very end of day one at the archive (day four of the blog), just as the lights in the room flashed to tell researchers that all materials must be returned to their boxes as that’s the end of the day. having picked up where i’d left off the day before, with the containers being mainly made up of handwritten notes, in painfully small writing, i mean a written line of writing that is barely bigger than the line it’s written on (at times), the progress for day two is good. most of what i find interesting from a research perspective comes from infinite jest and big red son, and the minor link between big red son and adult world. by the end of day two i have worked my way through 10 more containers. i leave to meet my sister on mlk boulevard and for the first time am able to walk through campus without need of a scarf. This entry was posted on Friday, February 7th, 2014 at 2:14 am	and tagged with David Foster Wallace, gender roles, journal, PhD and posted in David Foster Wallace archive, Writing. You can follow any responses to this entry through the RSS 2.0 feed.